Elephants, like all species, when young have a larger head to body ratio. Large heads are an indication of youth but as you can see the elephant has even a smaller head-to-body ratio, (microcephalus) which would indicate that they are not only mature, but they might be more mature and therefore larger than today’s elephants. Paleoloxodon Antiquus is Illustrated as an adult and not an infant. 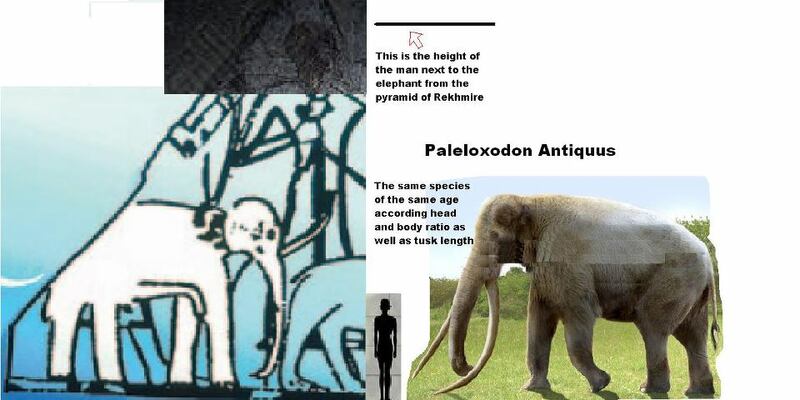 You can see in the gray-box and shadowed in back the size of a modern human-male compared to an adult male compared to Paleoloxodon Antiquus. In blue you can see the Illustration of the giant in comparison. This image represents a mature Paleoloxodon Antiquus maybe even more mature than anyone found to date considering the head to body ratio This is a mature adult, a very mature adult. The top of the picture is a dark black & white photo of the actual relief. People in the past were NOT primitive, it would be best to remove that word from the dictionary as it equates to the poverty of certain areas and not the technology or intellect of the age. The artists depicted what they saw exactly, and the proportions are correct. Many people may say “status” played a role in size, i will refute that as some slaves are depicted as large as the pharoahs while others are depicted small. “The artists are only depicting depth”: is refuted as well because large and small people often interact with the same objects. Conclusion: The artist intended to illustrate that some of the inhabitants of Egypt were indeed Giants, and depicted them with Paleoloxodon Antiquus to illustrate what the artist (who is a visual person) saw before his own eyes.